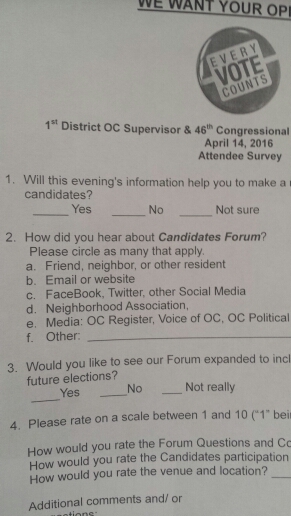 We’re live from the 46th Congressional District Candidate Forum, sponsored by Connect-to-Council, Santa Ana Chamber of Commerce, Garden Grove Chamber of Commerce, Fountain Valley Chamber of Commerce, Anaheim Chamber of Commerce, Vietnamese American Chamber of Commerce, and Santa Ana College. The 46th Congressional District Candidate Forum began after a 15-minute Intermission after the 1st Supervisorial District Candidate Forum concluded. Frontrunners Lou Correa (D-Santa Ana) and Joe Dunn (D-Santa Ana) are not present nor are the myriad of minor candidates. Former Rancho Santiago Community College District Trustee Mark McLoughlin (D-Santa Ana) is the moderator. Lynn Schott notes she and her family attended class at Santa Ana College. She was born and raised in the 46th District. She says she understands the district and that job creation should be the top priority. She says she will bring leadership. Bao Nguyen greets the audience in Spanish and Vietnamese. He speaks of being an immigrant as an infant. He says he grew up and went to high school in Orange County. He is the Mayor of his hometown of Garden Grove. He says established politicians taking campaign contributions from corporations and SuperPACs harken back to the Communist regime his parents fled. He speaks of expanding Spanish and Vietnamese programs in schools. He states he started Heroes Hall Veterans Foundation. He says he is fighting corruption locally and will do so in Washington, DC. Peterson states he was homeless as a 14-year-old in Orange County. He went to Loara High School and was inspired by two Sheriff’s deputies to join the Sheriff’s Department. He started washing laundry at the County jail and would return 22 years later to command the jail. He believes in serving the public, regardless of party or national origin. McLoughlin asks about federal support for community college. Nguyen notes he is a product of public schools. He speaks of K-14 education, including community college. He wants to prioritize education funding but opposes federal policies controlling local schools. Peterson notes he is an adjunct professor at both Santa Ana College and Brandman University. He speaks of his family’s student loan debt, both his and his wife’s as well as his children’s. Both of his children are in graduate school currently with heavy debt loads. He wants to reduce the federal loan burden on students. Schott paid her way through college. She wants to send federal money to states to support community colleges. McLoughlin asks about communities at risk in the district due to poverty and high unemployment. Peterson wants to fight crime to make the community safe for business to encourage entrepreneurs to open businesses in these communities, bringing new jobs. Schott rattles off the unemployment rates in each city in the district. She particularly emphasizes the unemployment rate among 18- and 19-year-olds. She wants to encourage a better business climate with increased opportunities for youth, including encouraging youth to open their own businesses. Nguyen wants to provide jobs by improving roads. He wants to expand apprenticeship programs with labor. He wants to provide infrastructure jobs. McLoughlin asks what two existing federal programs each candidate would eliminate. Nguyen wants to eliminate mass deportation. He speaks of his family’s separation during their immigration process. He wants immigrant children to have a chance at the American Dream like he did. Nguyen wants to end government mass surveillance and points to his father’s house arrest in Communist Vietnam. Schott doesn’t want to eliminate any agencies. However, she wants to examine the Environmental Protection Agency to determine if each regulation is worth the economic cost. She says she would do the same examination in other agencies. Peterson states it is important to understand the lay of the land. He opposes constantly reinventing federal education mandates. He questions Common Core, the EPA, and immigration policies. An audience question asks about immigration reform. Schott wants to secure the border and enforce existing laws. Nguyen wants comprehensive immigration reform. He blasts separation of families under current immigration laws. He speaks of his family being separated when they came to the United States. Peterson speaks of closing his windows and locking his doors at home and not letting strangers walk into his home without permission, but clothing and feeding those he invites into his home. He analogizes it with the need to enforce immigration laws and showing both compassion and common sense with immigrants. He wants to bring immigrants out of the shadows. The audience asks another question about immigration. Schott speaks of immigrants being part of America’s tapestry. She wants to encourage people to come with legal documents to achieve the American Dream. She wants to be careful with the number of visas. She wants college educated Americans to have jobs rather than importing international students into the U.S.
Peterson notes the United States is a melting pot, which is what makes the country great. He wants to secure the border and have a fair way to immigrate into the country. He says the current system is broken. He notes the 1986 immigration deal required securing the border but that was not enforced. He says reasonable people need to work together to fix the immigration system. McLoughlin asks about getting more federal tax dollars back to California since California is a donor state. Schott calls for examining potential tax reforms to let people keep more of what they earn. Peterson states even Orange County is a donor county. He would like to examine entitlement programs pulling resources away from California. He notes California has a larger population than Canada. He is concerned about jobs going overseas. Nguyen says Orange County does not make enough noise. He wants to fight for Orange County and use his background as a community organizer to get money invested in local education, public safety, and infrastructure. He speaks of making noise at least four times. An audience question asks about ending the War on Drugs. Peterson states it is not known how many lives are saved by a traffic signal. He speaks of his brother dying of drug-related cancer just two months ago. Peterson says he never tried drugs himself because of the War on Drugs. He does not want to give up on the War on Drugs. Nguyen wants to decriminalize marijuana. He speaks of an incident from last year of a Santa Ana Police raid where the officers kicked down the door and partook of some of the marijuana products. He says studies show legalizing drugs works. Schott calls for a balance. She is concerned about drug laws being enforced unfairly in minority communities and wants the laws enforced evenly. She wants to look at budget priorities on creating jobs, improving the business climate, and strengthening education. An audience question asks about Alzheimer’s research and care. Nguyen says there needs to be more federal funding for research for all diseases. He wants to restrict pharmaceutical companies’ prices. He doesn’t want pharmaceutical companies to own patents for drugs developed with research paid for by federal funds. Schott wants to straighten priorities. She wants to reduce regulations on business and instead fund agencies providing senior services. Peterson speaks of the challenges of caring for loved ones with Alzheimer’s or dementia. He wants to end wasteful research like studies on goldfish intoxication and alligator races to instead fund research into diseases and to fund senior services. McLoughlin asks about crime and gun control. Schott attacks Prop 47 for causing increases in crime. Nguyen criticizes the prison-industrial complex. He says Orange County leaders need to fight for Prop 47 dollars. He says Orange County needs to bring more money rather than attacking Prop 47. He blasts the United States for having more inmates than Communist China. Nguyen says Washington is broken, and he can fix it. He says the candidates who did not show up are just playing the game. He blasts candidates for abstaining on votes and suing over personal problems. He blasts corporate contributions. Peterson notes he is not a politician, just an average guy. He has served on school district committees and in public service in the Sheriff’s Department. He calls for an end to fear-mongering. He wants people to listen to what people are saying instead of hype. Schott states she is not a career politician or a tool of special interests. She wants to solve the challenges of the 46th District. She wants to invest in the dignity of the community. She states she will take action. The forum ends after about one hour.